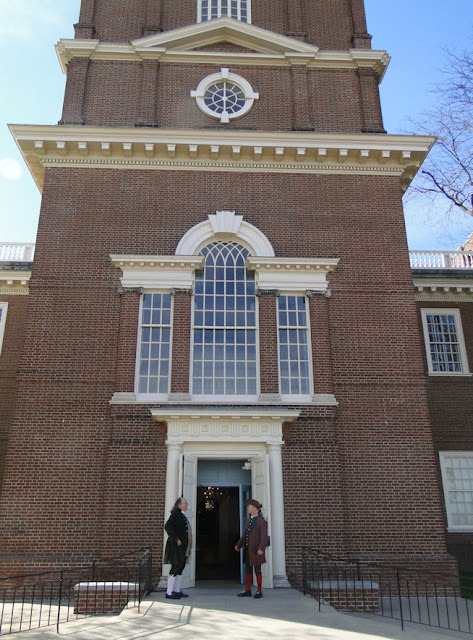 Who are these two guys standing in front of the Pennsylvania State House? We, as living historians, are an unusual lot. and we like to dress up in old-timey clothes and pretend that we live in the past. And we think little of spending quite a bit of money for this pretending. Foolishness is what it is. And I'm the biggest of them all. I mean, it's one thing to reenact at a historic event, but me? Going beyond what most reenactors do. Don't ask me why, for I can't explain it. I am part of an unusual lot indeed. Foolishness, yes...but I love it. I don't believe there is another month that has as many major American historical events occur as the month of April. Now, I'm not speaking of births or deaths, but of the happenings that most history books will, at the very least, mention. ~April 15 - 1865 - President Lincoln died 7:22 a.m. I realize there were a number of other historical occurrences in April, but I only wanted to list the most well-known. Now I would like you to go and ask your kids or your spouse or other family member or friends if they know of these important historical events. Give them the TEST and see how they do! Well, since this month of April is so historical, I usually do my own remembrance to commemorate Patriot's Day - April 19th - the date that signifies the beginning of the American Revolution, which is, to me, every bit as important as Pearl Harbor Day, President's Day, or any of the other holidays of acknowledgement for our nation. Yes, there are the citizens who live in the states of Massachusetts, Maine, and Wisconsin who celebrate Patriots' Day; to many in those states I am sure it is a welcome day off work or school. But at least there is some acknowledgement for this day in which the brave patriots who were there at the beginning - at the conception of the United States of America - are honored. And they are honored more than with burgers, fries, and furniture store sales: in the area around Lexington and Concord, re-enactments of the battles in 1775 and the events leading up to them are held. A particular highlight is the opportunity to ring the bell that warned the local troops that Regulars (British soldiers) were approaching. Lectures, concerts and road races are also organized. And do you know how I observe it, right? Yessir (or ma'am)! 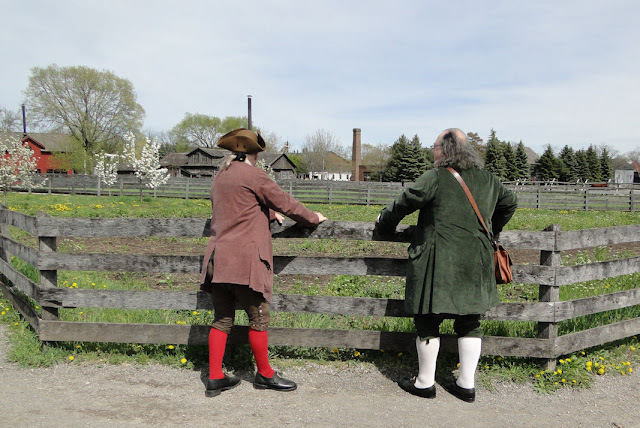 I visit Greenfield Village, Michigan's own 300 acre celebration of the past, and I try to go as close to April 19th as I can. This year it happened to be Saturday, April 22nd. 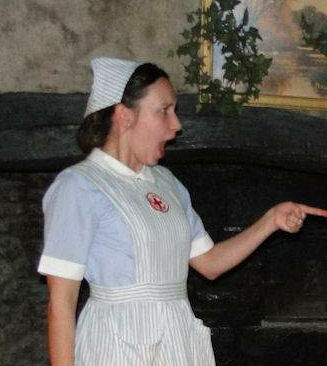 Do I even have to mention that I was in period clothing? Colonial clothing, to be more precise. Even better, my dear wife came along with me. And we also had a special guest visitor with us! When Henry Ford built his Greenfield Village open-air museum in 1929, he also built an indoor museum to go alongside of it. And he wanted this very American museum to be something grand - very special - he wanted it to stand out like no other. 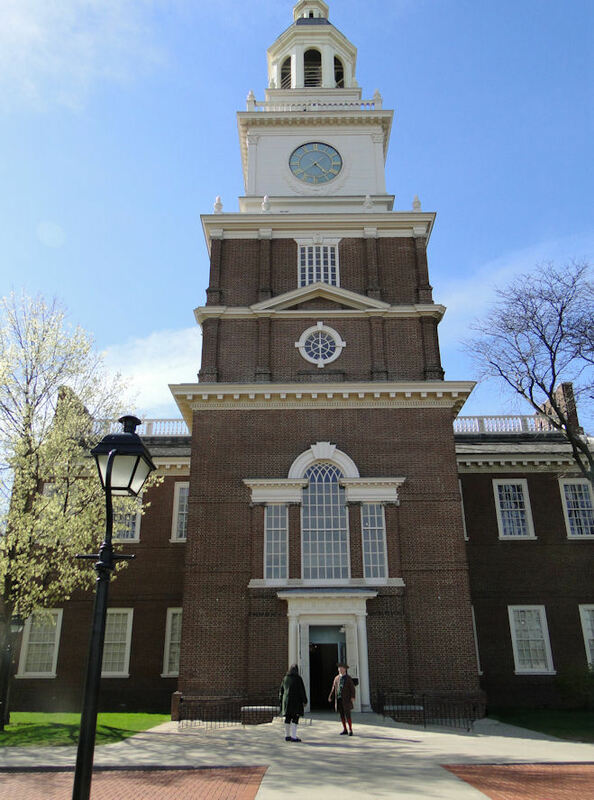 And to accomplish this he had a replica of the facade of Independence Hall in Philadelphia built as the museum's entrance. 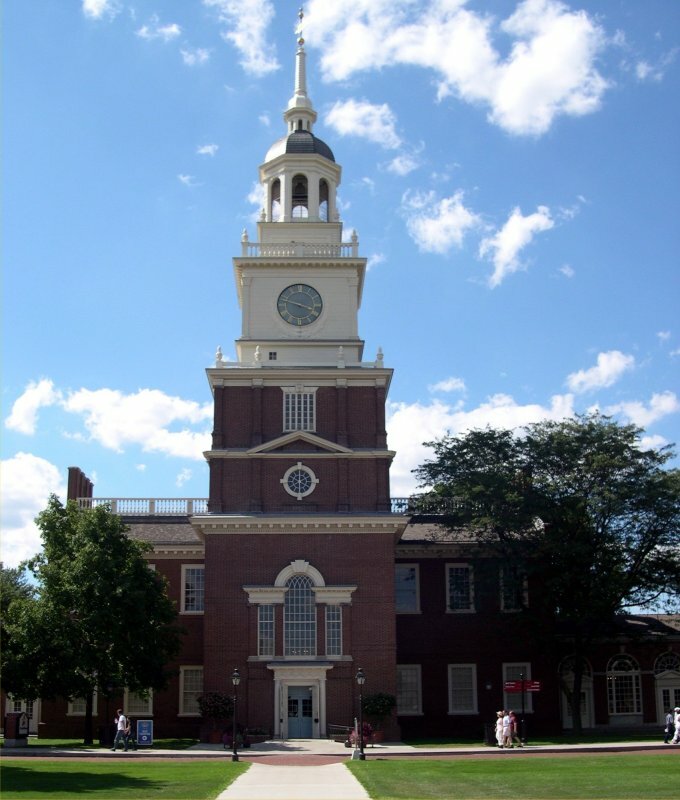 What could be more of a symbol of America than Independence Hall? Ford hired architect Robert O. Derrick to have this version built exactly in the same architectural style as the current one in Philadelphia, and he spared no expense in doing so, including the same mistakes of the original, such as the windows in the tower being slightly off center by a couple inches. In fact, Ford went so far as to also have the front foyer, which is located under the clock tower, replicated as well. 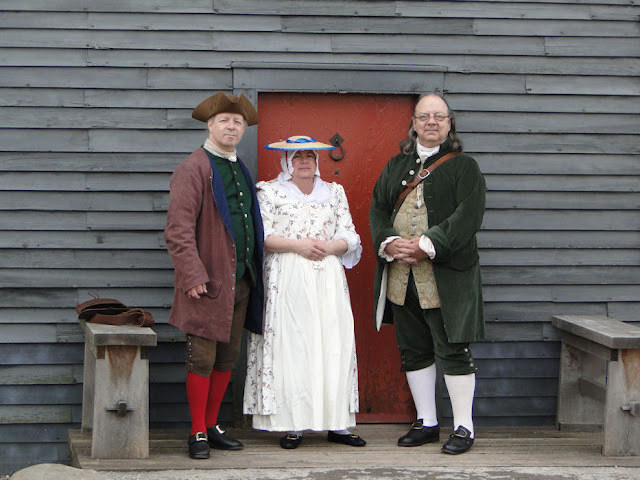 And that's where our story begins - on a beautiful late April day when my wife and I, dressed in our 1770s clothing, traveled to this wondrous place of history. And seeing the majestic clock tower of the replicated Independence Hall rising over the trees, I knew, dressed as I was, that I needed to stop there first (we must remember, however, that the steeple of Independence Hall, originally known in the 1770s as the Pennsylvania State House, did not look then as it does today. It was redesigned in 1828 to appear as we now see it, with more ornamentation and the clock). 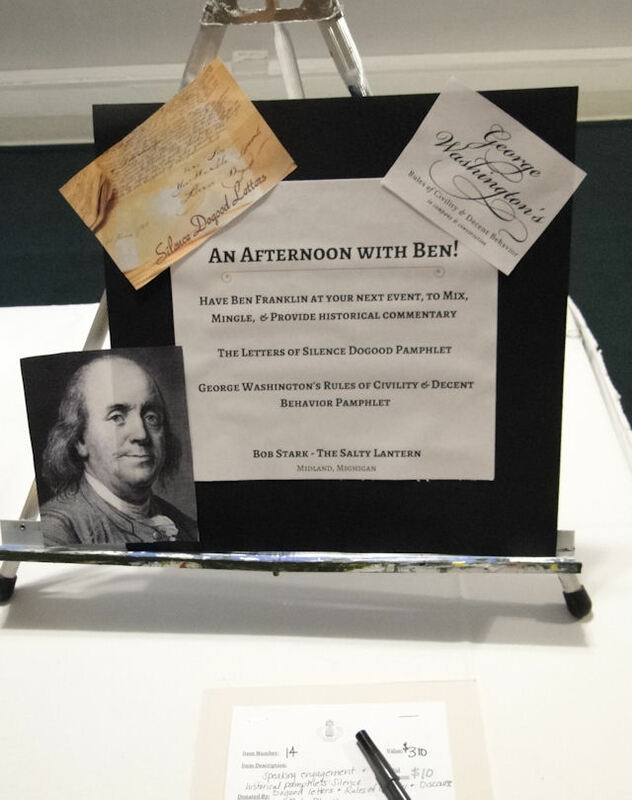 Why...Dr. Benjamin Franklin! It is an honor, good sir, to meet you! 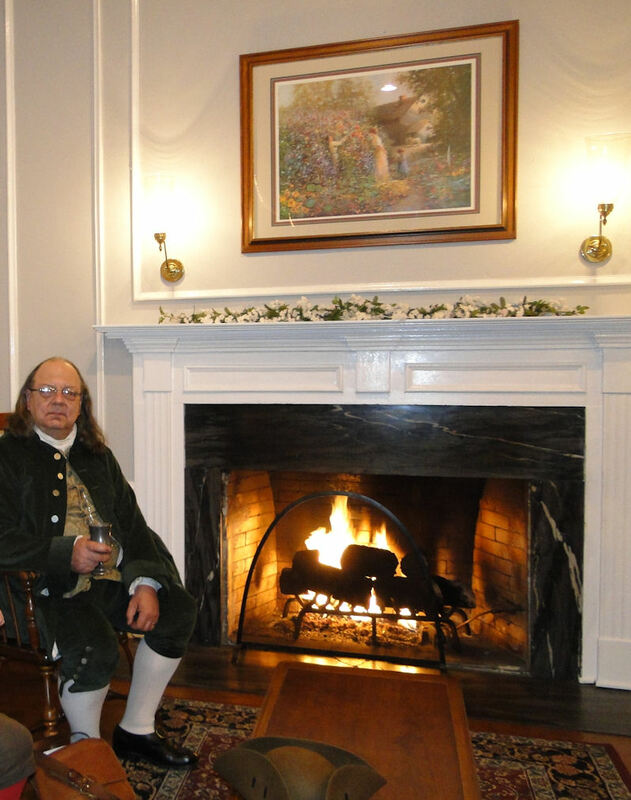 I suppose if I would want to meet anyone while in the Pennsylvania State House, it would be Ben Franklin, a true Patriot and, perhaps, the United States' finest citizen. As Dr. Franklin explained, it was here where the 2nd Continental Congress met, and it was also where the Declaration of Independence (of which Franklin helped to write) and the U.S. Constitution were debated and adopted. Oh, it certainly was an honor indeed to hear these stories from "the man" himself! (Remember - this is a replicated building we are in - not the original. 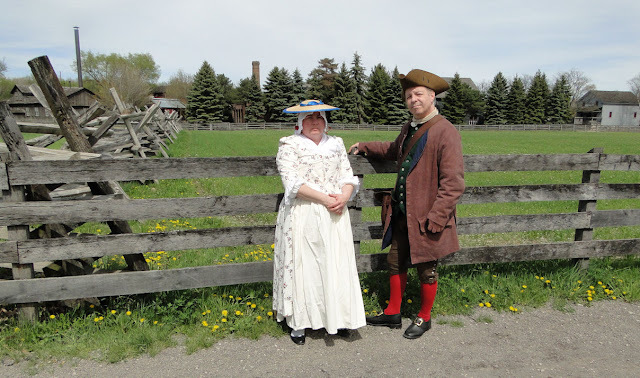 my wife and I while we visited Greenfield Village. Village such an amazing place. I explained that it was 300 years of (mostly) American history, that he would see how the United Sates grew after his time. I also mentioned that there was a special area dedicated to the founding generation, and seeing this section of the Village would almost be like "going home" for him, for he shall be immersed in his own time - a time that he would find quite familiar. Dr. Franklin said he would be delighted to join us on our excursion. Well, then, shall we go? You know, of course, that I had my trusty camera with me, hidden inside my satchel, and I was able to get some pretty decent photos documenting our every move. As you are seeing here, every picture really does tell a story. So it was off to the far end of Greenfield Village - the colonial area - to begin our visit. 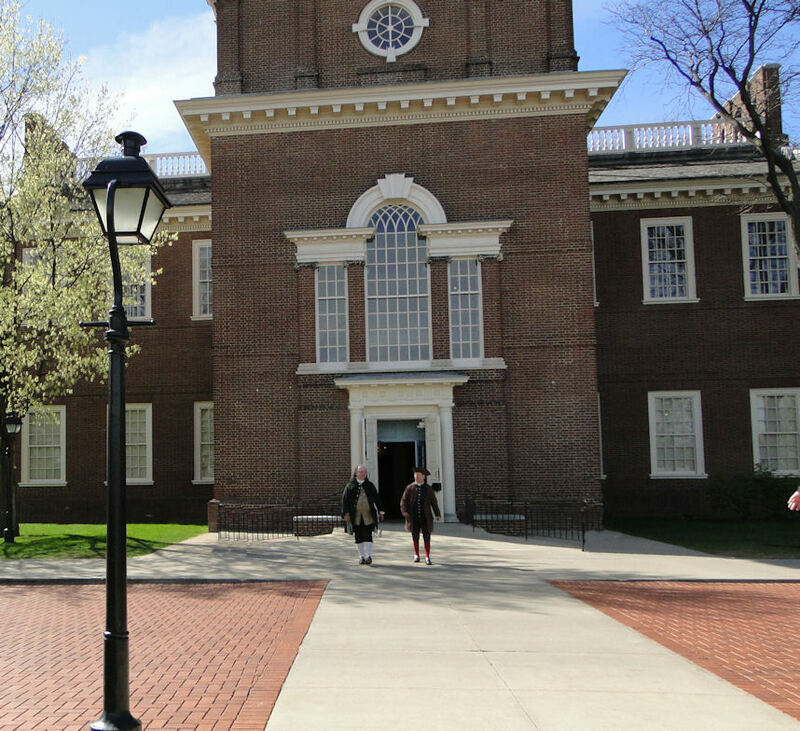 This is where the wonderful original mid-18th century structures, whose architecture style would be familiar to Dr. Franklin, are situated. 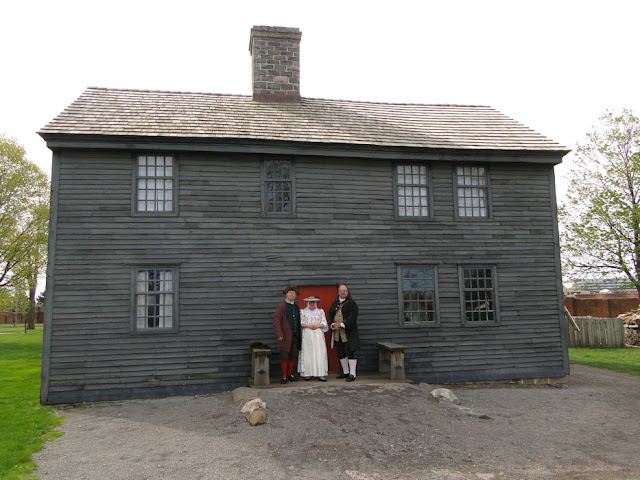 From left you see me, my wife, and Benjamin Franklin standing in front of the Daggett break-back (saltbox) style house built around 1750. In fact as we moved up to the front door, one of the young ladies opened it and exclaimed, "Imagine! We have Benjamin Franklin visiting us right here at the Daggett house!" This being April, it was still rather chilly outdoors, so we were welcomed to sit and warm ourselves at the hearth. Besides farming, Samuel Daggett was also a housewright and built this particular house on a spot known as Shoddy Hill Road, atop 80 acres of land. His wife, Anna, ran the home and cared for the family. She prepared and preserved food; spun yarn; made clothing, towels and sheets; gave the children their earliest lessons in reading and writing; and fed the animals including chickens and pigs. 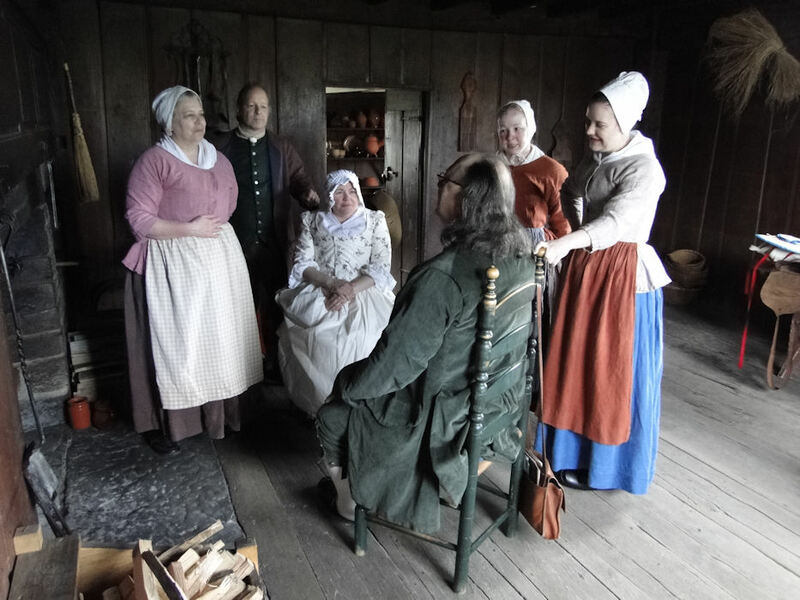 The three Daggett children were prominent in helping out in household duties: Asenath and Tabitha would have learned the skills of "housewifery" from their mother. They would have prepared yarn by carding and spinning; made clothing, soap and candles; tended the garden; and prepared food. But on this day, all was forgotten because a very special visitor came a-calling. Dr. Franklin regaled our hostesses with stories of his time in France. 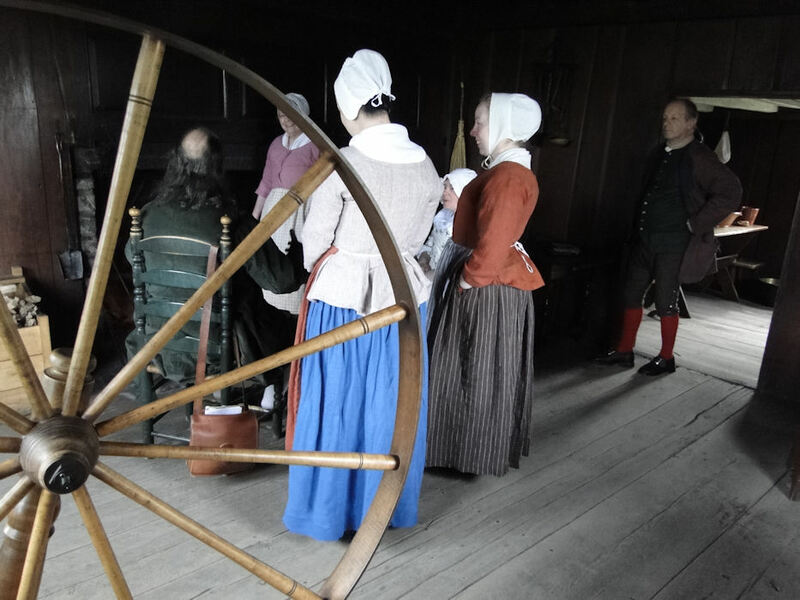 As the ladies here have never been any farther from their home than the town of Coventry, hearing tales from afar kept them enthralled - so much, in fact, that they had nearly forgotten about doing their chores! Daggett Farm for being such wonderful hostesses. Our next stop was at this beautiful house built in the mid-1700s, the Giddings home. 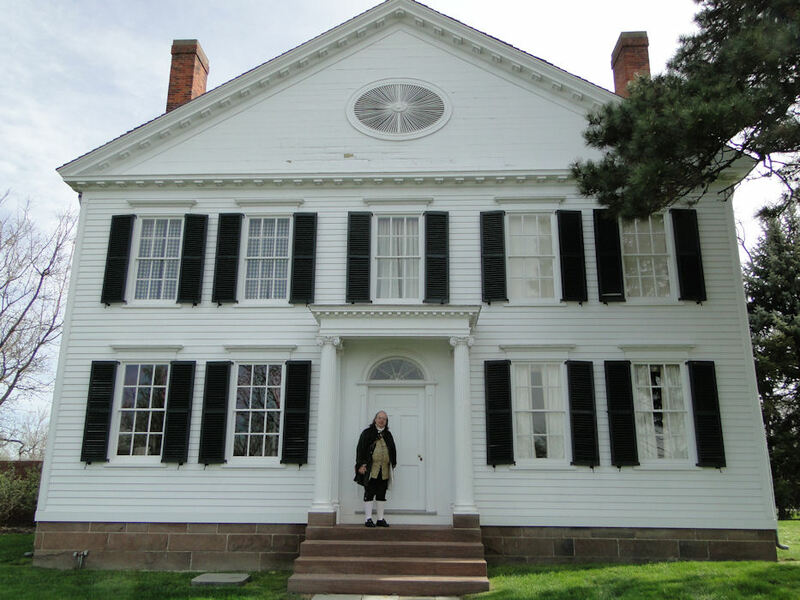 It was around 1751 that merchant John Giddings built this house, shortly before he married Mehetable Gilman in the fall of that same year. The structure is wonderful example of an upscale New England colonial home. 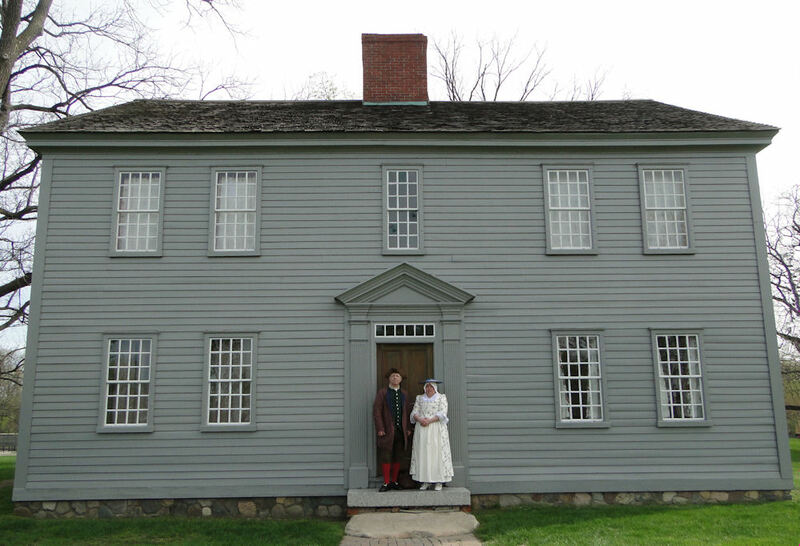 By the way, Patty and I purchased this house while visiting the 18th century. in our home will actually be open for guests. Our next door neighbors are the Websters: Noah and his wife, Rebecca. American Dictionary Noah had put together and was impressed with his Americanization of the English language. 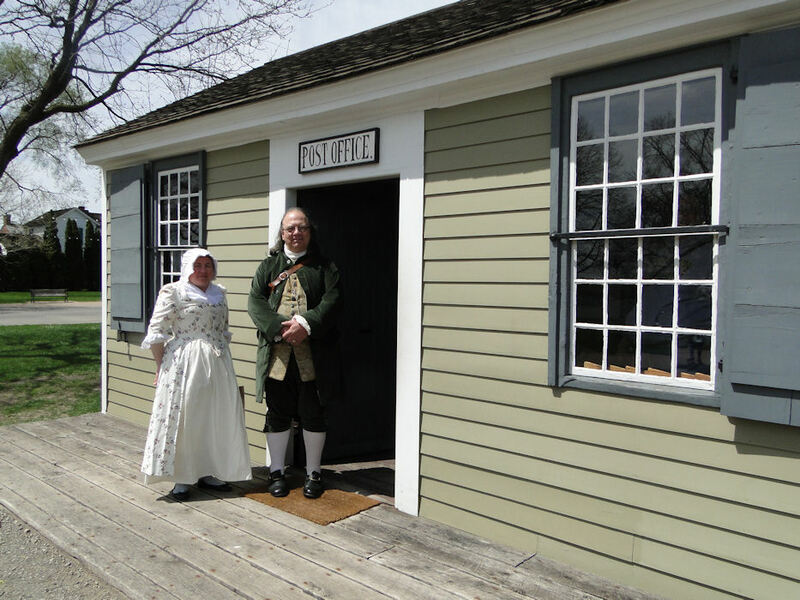 Where else but Greenfield Village can someone like Benjamin Franklin visit the 1822 Noah Webster House? 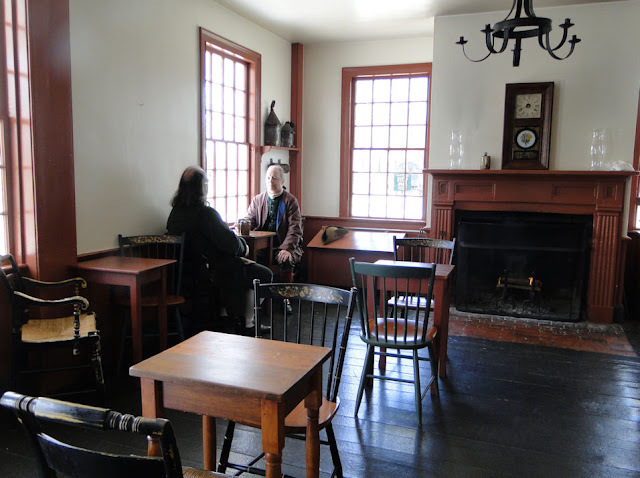 Greenfield Village also has the wonderful mid-19th century Eagle Tavern, a favorite place for my wife and I to eat. The atmosphere is very period and the food is not only delicious, but is served seasonally and historically accurate. Eating there while wearing clothing of times past only adds to the flavor of the experience. One of the things I learned while researching the old taverns as I was writing THIS post and THIS post is that clothing fashions might have changed, but the basic look and lay out of most taverns changed little from the mid-18th century through much of the 19th century. 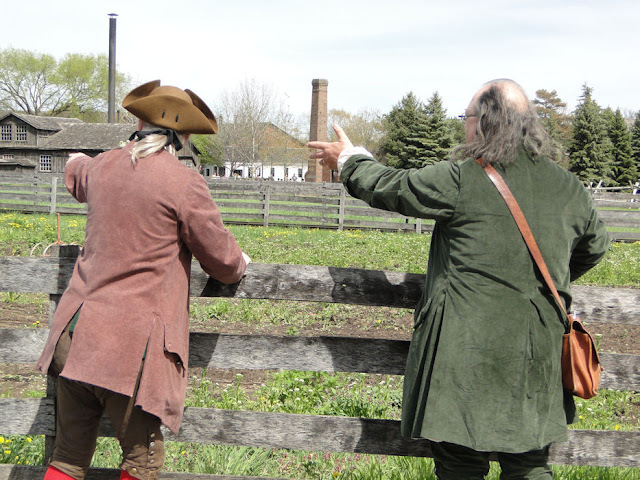 Greenfield Village was even a thought. 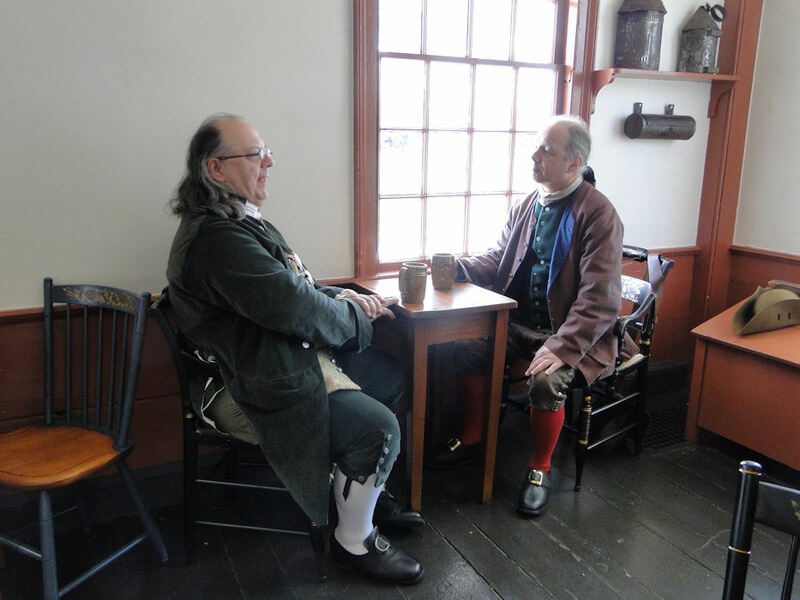 Taverns were the pulse of 18th century urban life, and their importance to the local community cannot be overstated; they were the main source of information for the locals. 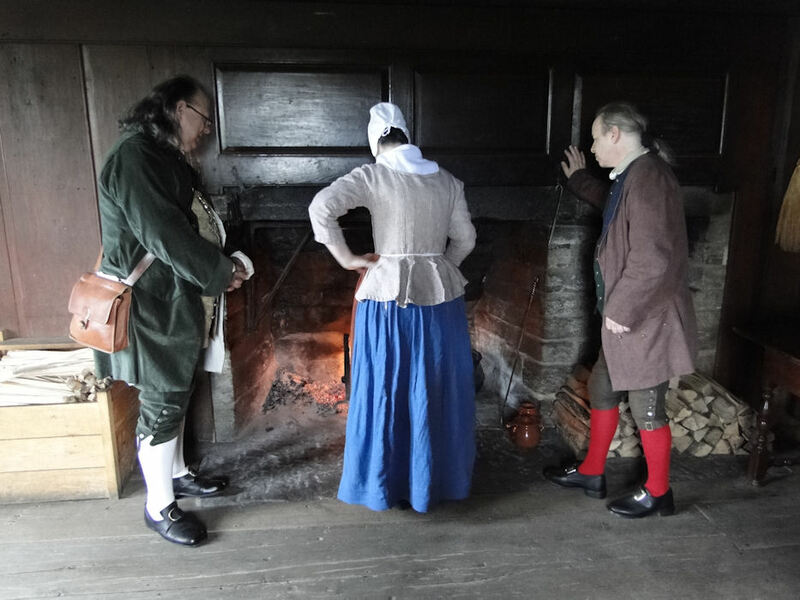 These "publick houses" (or 'ordinaries,' as they were also known) have played an important part in social, political, and even military life. By the way, the word we know as "pub" is short for the colonial term publick house. 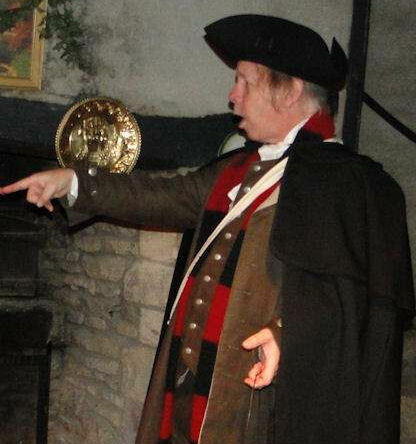 The tavern owner was a very prominent man in town, and was thoroughly informed on all public and most private matters. He was certainly the best-known man around, that's for certain, and he made it a point to get to know all of his patrons. 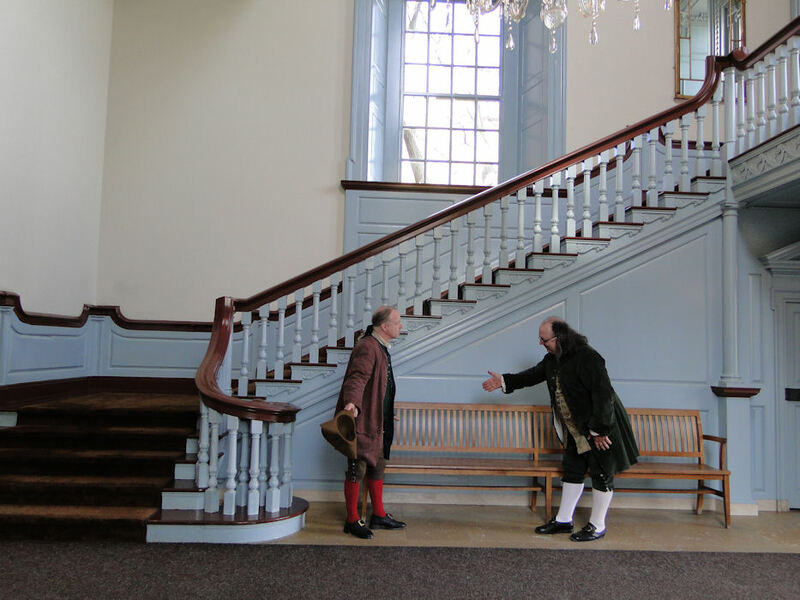 “I have heard Dr. Franklin relate with great pleasantry that in travelling when he was young, the first step he took for his tranquility and to obtain immediate attention at the inns was to anticipate inquiry by saying, 'My name is Benjamin Franklin. I was born in Boston. I am a printer by profession, am travelling to Philadelphia, shall have to return at such a time, and have no news. Now, what can you give me for dinner?'" who mixed dark treason to King George with every bowl of punch they drank. 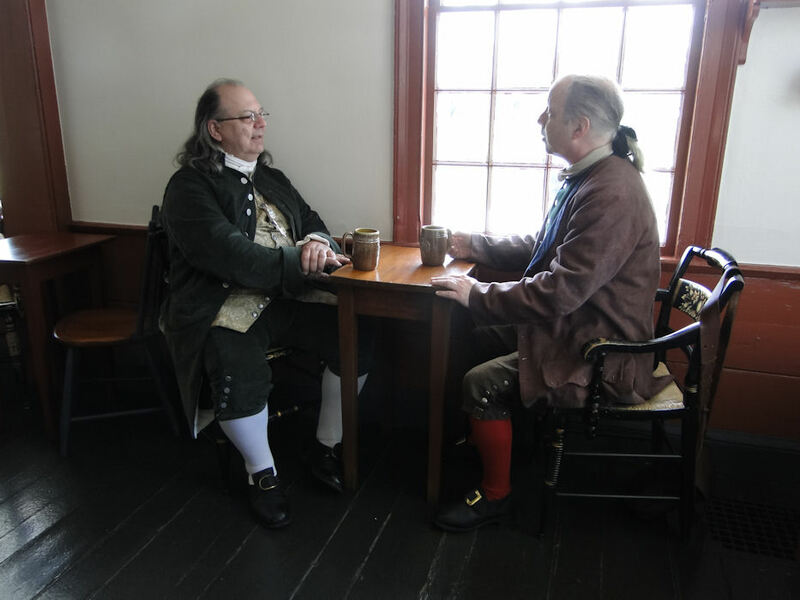 Though I have written two postings about taverns in our nation's history, I have to agree with author Christopher Hitchens when he suggested that a "monograph should be written on the role of the tavern in the American Revolution." Yes, they are that important. I also like what another author, Adrian Covert, wrote: "The best part about surviving taverns...is that for them history hasn't stopped. These aren't museums, these are (historic) conversations about politics, food, culture, and life." 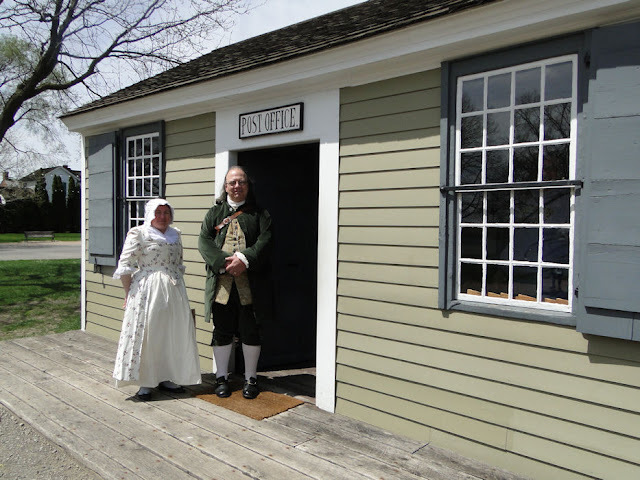 We know that Greenfield Village's 1831 Eagle Tavern is not a true Revolutionary War building (even if its style is very similar), but it still has an amazing history to it. 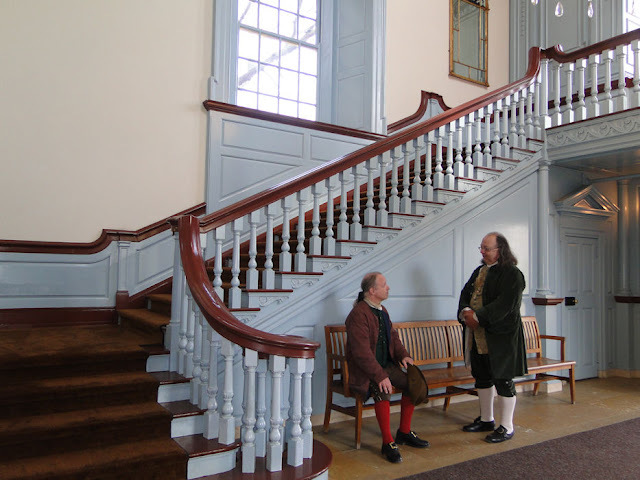 And, yes, I believe Dr. Franklin and I really did help to give the old building a more 18th century feel rather than of the 19th century, at least while we were in the bar area. Patty and I continued our stroll through the Village with Benjamin Franklin, and we came upon a post office. Well, when you have someone like Benjamin Franklin with you, there was no choice but to go inside. beautiful example of a Post Office from the early 19th century. 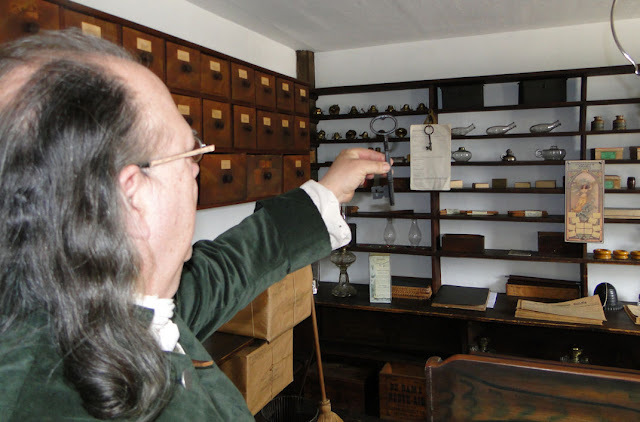 As we walked inside, the presenter greeted us with a large smile and said, "And here is the first Postmaster!" Yes, it was an honor for Dr. Franklin to be remembered in this manner, for it was in 1775 when the Continental Congress appointed him Postmaster General. Franklin had previously served in that position under the Crown. 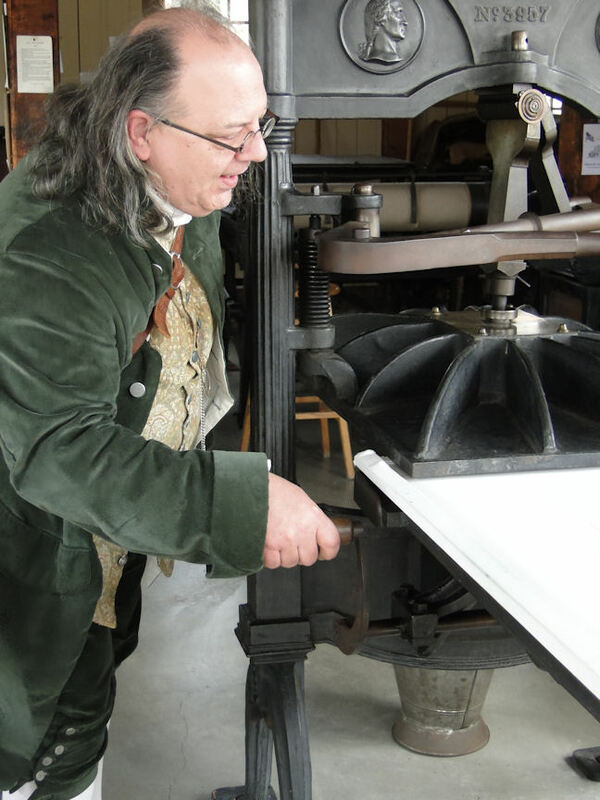 Benjamin Franklin: "(My) bookish inclination at length determined my father to make me a printer, though he had already one son (James) of that profession. 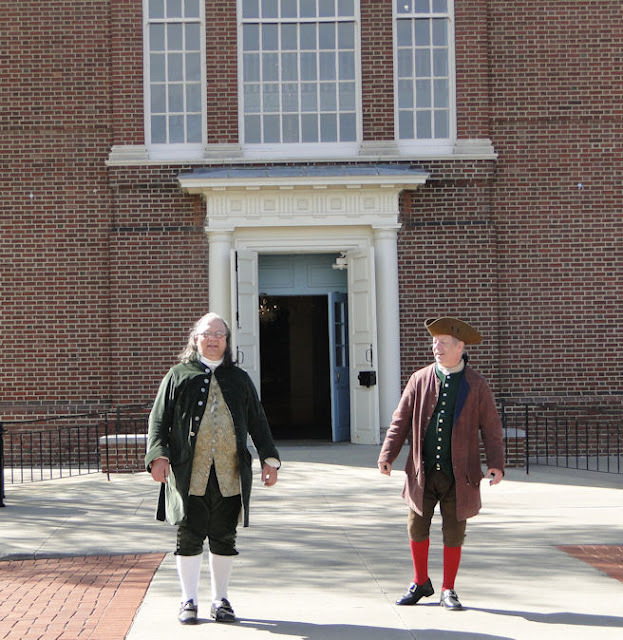 In 1717 my brother James returned from England with a press and letters to set up his business in Boston. I liked it much better than that of my father (as a chandler), but still had a hankering for the sea. To prevent the apprehended effect of such an inclination, my father was impatient to have me bound to my brother. I stood out some time, but at last was persuaded, and signed the indentures when I was yet but twelve years old. I was to serve as an apprentice till I was twenty-one years of age, only I was to be allowed journeyman's wages during the last year. In a little time I made great proficiency in the business, and became a useful hand to my brother. Though a brother, he considered himself as my master, and me as his apprentice, and, accordingly, expected the same services from me as he would from another, while I thought he demean'd me too much in some he requir'd of me, who from a brother expected more indulgence." Dr. Franklin was not so familiar with the newfangled press. as an apprentice to his brother. Hmmm...the printer didn't do too bad of a job with Dr. Franklin's likeness. The colonial farmer of the 18th century relied on his large family for labor. He raised cotton, hemp, and flax, cobbled his own shoes, and constructed his own furniture. And once springtime came around, planting preparations would begin, and the farmer would continue the ritual of hauling the manure pile that he’s been keeping all winter - load after wheelbarrow load (or piled onto a horse-drawn cart) - out to the planting field, to be spread as far and wide as possible. Then came the process of plowing, which is an unbroken link to the past. The plow, one of the oldest of farming tools, breaks up and turns over the soil to make it smoother for planting. Arms, as used to plowing as they were, would still ache nightly, and ache even worse come the next day when the farmer, once again, found himself behind the two plow horses in the cool of the morning, digging the mould-board tool into the ground to turn up the soil that had laid dormant and frozen all the long winter. Now it's time to harrow the plowed field. Harrowing is the process of breaking up the clumps of soil to further spread and even out the dirt for planting. Only after all of this would it be time for planting. "I am not looking forward to manuring, plowing, and harrowing. The labour is so strenuous." "What do you plan to plant?" "I think I will put the squash there, beans there, and lettuce way over there..."
"Why don't you plant watermelon? I hear its taste is like sweetened snow." I know my wife would certainly enjoy it! Well, all good things must come to an end, and the time had come for Patty and I to depart from our friend. Before we left, I wanted one more "quick sketch" of my lovely wife and I. We had a tremendously good time - one that won't soon be forgotten. 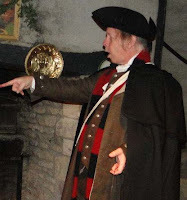 Throughout the day, as we journeyed among the historical buildings of Greenfield Village, many folks, both adults and children, stopped Dr. Franklin just to say "hi," and maybe ask a couple of questions or even get a photo taken with him. But what really moved me was when people - adults, mind you - would shake his hand and thank him for all the good he had done for our country. Wow---there is plenty of patriotism around. Such a wonderful feeling. But now, I suppose, I can let the cat out of the bag: that wasn't the real Benjamin Franklin I was with. It was actually Bob Stark who portrayed the historical figure. Yes, it was a portrayal, but because the resemblance between the two men is uncanny, it was hard not to think of them as one and the same. And then to see the smiles on the faces when people saw him...I have to be honest with you, it was very cool and truly very moving to see this. And believe it or not, a few of the folks even called me Paul Revere! 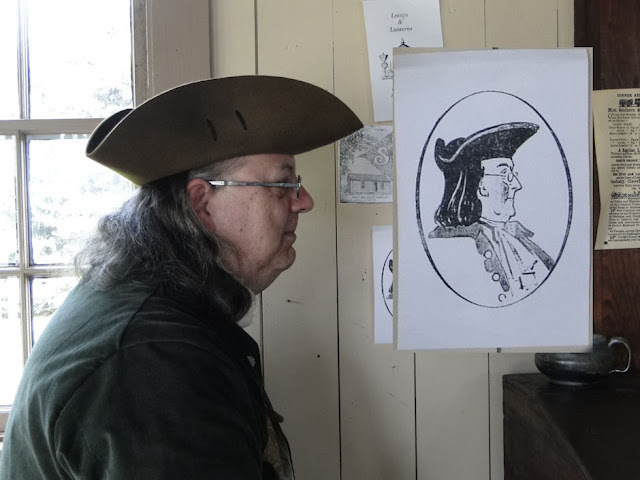 Now - seriously - how would they have guessed that I present as Paul Revere? I mean, yes, I do portray the man, so it was an unexpected honor, but it's not as if I look like him. 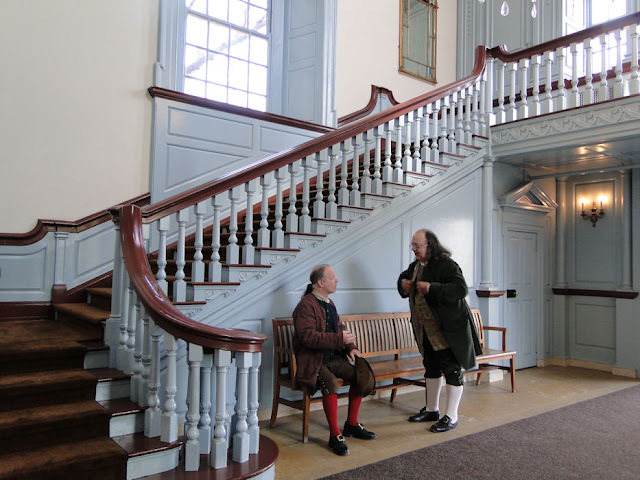 But it added to everyone's experience, of which I am heartily glad, and there were even a few rather nice conversations I had with a number of visitors who also had questions for me. Some even remembered the date of my ride, April 18, 1775, which occurred only a few nights before. Very moving and cool indeed. Maybe we're not so foolish after all. So, until next time, see you in time. On the Friday evening before Greenfield Village, I volunteered my time as Paul Revere to help out the Plymouth (Michigan) Fife & Drum Corps, which is "an all youth corps from Plymouth and surrounding communities dedicated to preserving the ancient arts of color guard, fifing, and drumming through live performances." This was their first gala fundraising event, and for attendees/donors it included a fine meal, personal visits from Dr. Benjamin Franklin & yours truly, Paul Revere Esq., along with contra-dancing including dance instruction provided by the best band in the business, the Old Michigan Ruffwater Stringband, headed up by Glen Morningstar. Dr. Franklin and I went around to the different tables, speaking to the attendees, who were none to shy about asking questions (which is a good thing, right?). A number of people asked if I was okay after my big ride a few nights before. Of course, I thanked them for their concern and assured them that even though I was caught by the Regulars, I was quite alright. My number one question of the evening was, believe it or not, what was the name of the horse I rode on the evening of April 18, 1775. I'll be honest, in the couple of years I have been presenting as Paul Revere I have never been asked that question before, so my answer to them was "I do not know. With the events of that evening, I was not too concerned about remembering the name of the horse I was riding." However, when I went home that night, I looked it up. The closest answer I could find was "Brown Beauty," and even that is not 100% for certain. Paul Revere simply says that he rode "a very good horse." Sorry folks, that's the best I can do! Anyhow, the evening was a great success, and one of my personal highlights was hearing the Plymouth Fife & Drum Corp perform a few tunes. 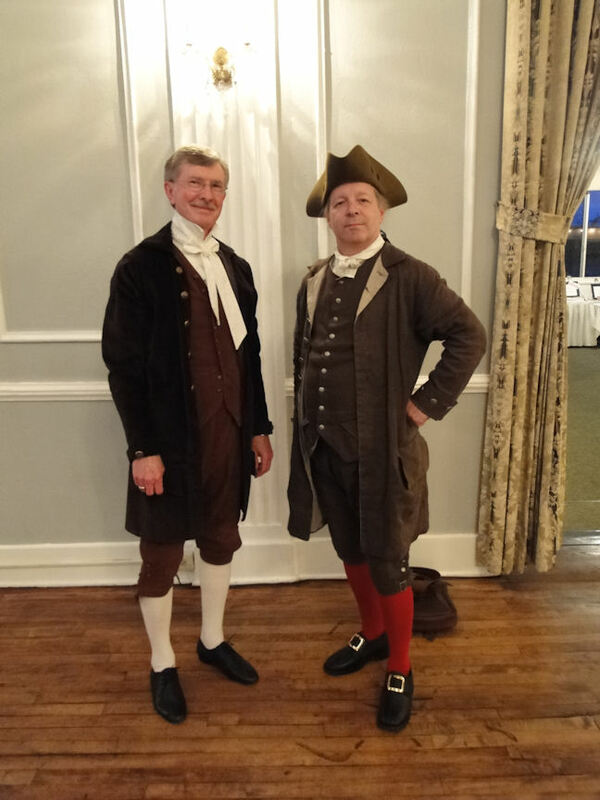 I let the hostess know that I would be happy to help again for next year's event, for I did enjoy speaking with the many donors as well as hearing the fife & drum corp perform. 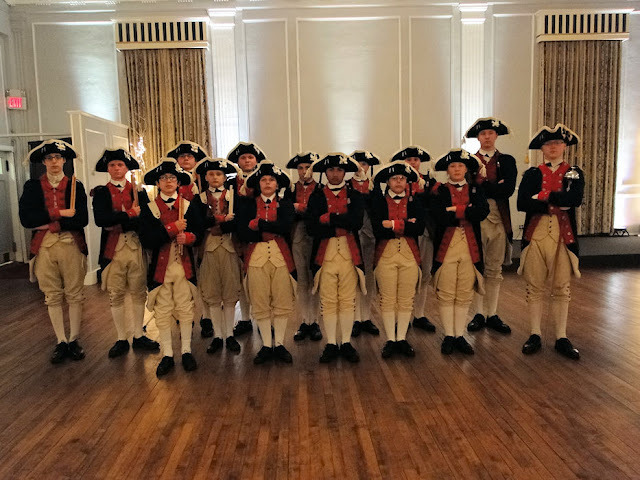 I got the Plymouth (Michigan) Fife & Drum Corps to pose for me. services in a silent auction to help out the cause. If you feel the desire (and are able) to help these young musical preservationists out, please click HERE to go to their Facebook page, just in case you want t see more of what they are about.